Hurricane Irma -- the most powerful hurricane in more than a decade to threaten the Atlantic coast -- has been making its way through the Caribbean with the likelihood of affecting Florida by late this weekend. Evacuations already were under way by midweek in several Florida counties. The National Hurricane Center (NHC) has called Irma "an extremely dangerous category 5 hurricane." Hurricane-force winds extend outward up to 50 miles from the storm's center. The NHC has warned that the combination of a life-threatening storm surge and large, breaking waves will cause above-normal tides and flood normally dry areas near the coast. Rainfall of up to 15 inches or -- in isolated instances -- 20 inches has been predicted. W1AW at ARRL HQ will be in monitoring mode through Saturday and will activate on Sunday. Ham Aid equipment has been deployed to the West Central Florida Section, where ARES teams in at least three counties are ready to support shelter communication. The Hurricane Watch Net (HWN) activated on September 5, and by mid-week was watching three hurricanes -- Category 5 Irma; Category 1 José, following behind Irma, and Category 1 Katia in the Gulf of Mexico. "It now looks like the Hurricane Watch Net will be working on two land-falling hurricanes," said HWN Manager Bobby Graves, KB5HAV. 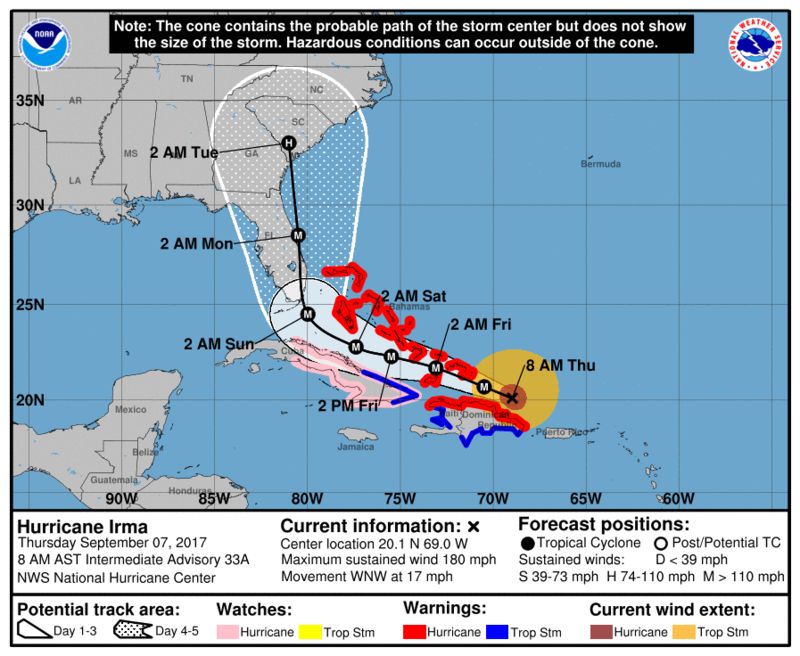 "Over the next few days, Irma will affect Hispaniola, Cuba, the Bahamas, and Florida." "José could affect the northern Leeward Islands Saturday or Sunday as a Category 2 Hurricane. Katia is forecast to make landfall on the coast of Mexico as a Category 2 Hurricane late Friday evening or early Saturday morning. The HWN's primary frequency is 14.325 MHz, and its nighttime frequency is 7.268 MHz, although the net could operate on both frequencies simultaneously. Graves said the net, which marks its 52nd anniversary this week, would remain in continuous operation until further notice. The VoIP Hurricane Net activated on September 5 -- as did WX4NHC at the NHC. Both the HWN and the VoIP Hurricane Network relay hurricane "ground-truth" information via WX4NHC to the NHC to assist forecasters. Any Amateur Radio operators in the affected area of Irma or with relays into the affected area of Irma are asked to provide surface and damage reports into the VoIP Hurricane Net for relay into WX4NHC. SKYWARN Nets active as Irma moves through the Caribbean can pass reports to the VoIP Hurricane Net for relay into WX4NHC and are asked to designate a net liaison or connect directly to the *WX_TALK* EchoLink conference node: 7203/IRLP 9219. Stations on AllStar can connect to the EchoLink side of the system by dialing *033007203. IARU Region 2 Emergency Coordinator Cesar Pio Santos, HR2P, compiled a list of emergency frequencies, subject to change, for use in the Caribbean in anticipation of Hurricane Irma. Radio amateurs not involved with the emergency should avoid these frequencies. Puerto Rico: 3.803, 3.808, 7.188 MHz. Radio amateurs in Puerto Rico also will cooperate with the HWN on 7.268 and 14.325 MHz. Cuba: Days, 7.110 MHz (primary) and 7.120 MHz (secondary); Provincial Net -- 7.045, 7.080 MHz, and on other lower frequencies as necessary. Nights, 3.740 MHz (primary) and 3.720 MHz (secondary), and on other lower frequencies as necessary. Dominican Republic: 3.873 MHz (primary), 3.815 MHz (secondary), 7.182 MHz (primary), 7.255 MHz (secondary); 14.330 MHz (primary), 21.360 MHz (primary), 28.330 MHz (primary). Caribbean Emergency and Weather Net (CEWN): 3.815 MHz and 7.162 MHz (when necessary). The net has activated continuously until the hurricane passes through. The Salvation Army Team Emergency Radio Network (SATERN) encouraged its operators to start monitoring the HWN. On Wednesday, September 6, the International SATERN SSB Net moved to a Delta II (extended monitoring) status from 1400 until 2300 UTC. SATERN National Liaison Bill Feist, WB8BZH, said that schedule could hold through the end of the week. Stations on the net will seek information on emergency, priority, or health-and-welfare traffic, situation and hurricane damage, and communication disruptions. SATERN will not accept health-and-welfare inquiries. These suppressed-carrier reference frequencies -- also known as dial frequencies or window frequencies -- 5330.5 kHz (voice), 5346.5 kHz (data), 5357.0 kHz, 5371.5 kHz, and 5403.5 kHz, may be used as part of the event. The FEMA point of contact is Dave Adsit, KG4BIR, FEMA Spectrum Manager, (540) 272-4605. The FCC Wireless Telecommunications Bureau (WTB) reminded licensees this week that FCC rules address operation during emergencies. "These rules allow licensees to provide emergency communications during a period of emergency in a manner or configuration not specified in the station authorization or in the rules governing such stations," the FCC said. The FCC contact for Part 97 (Amateur Service) rules is Mike Regiec, (717) 338-2603. During non-business hours, contact the FCC Operations Center, (202) 418-1122. Updates on storm-related Amateur Radio activity are posted on the ARRL Hurricane Irma page. The FCC Technological Advisory Council (TAC) is looking into FCC technical regulations to determine if reforms or changes might be in order. Greg Lapin, N9GL, represents ARRL on the TAC and chairs the ARRL RF Safety Committee. The FCC Office of Engineering and Technology (OET) announced the TAC public inquiry (ET Docket 17-215), which seeks comments by October 30 regarding technical regulations and the process for adopting and updating them. 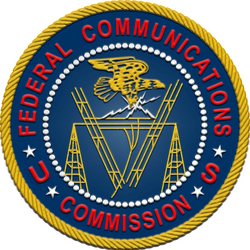 "To more effectively ensure that its rules keep pace with the rapidly changing technology in communications, the FCC has asked its Technological Advisory Council to help identify FCC technical rules that are obsolete or may be ripe for change in light of current communications technologies," the OET said in an August 31 Public Notice. Made up of technological experts in various areas -- some of them radio amateurs -- who advise the FCC in technical matters, the TAC is gathering feedback from users and vendors of communications technology affected by technical rules. "Some technical rules may no longer be applicable to modern communications equipment," the Public Notice said. "Rules that describe the operation of certain technologies may no longer be necessary, as those technologies are obsolete. Data reporting requirements for technical operations, which help the FCC to determine how effectively the communications environment is being utilized and also how communications entities are complying with the current laws, may no longer be necessary." On the other hand, the OET said, some communications users may feel that certain existing regulations protect their operations and should not be removed. In addition to seeking comment on specific regulations, the TAC is looking for input on how the regulatory process could be made more efficient and timely. The TAC plans to concentrate on issues of a technical nature and is looking for responses related to specific rules that should be considered for removal, retention, or change, and discuss the rationale behind each proposal. Interested parties may file comments until October 30, using the Commission's Electronic Comment Filing System (ECFS). For more information, contact Greg Lapin, N9GL, or TAC working group FCC liaison Walter Johnston. Both professional and citizen scientists conducted formal and informal investigations into the effect of the August 21 solar eclipse on HF radio propagation. Nathaniel Frissell, W2NAF, of HamSCI, has said it will take some time to get a more scientific analysis of data that was compiled during the Solar Eclipse QSO Party. 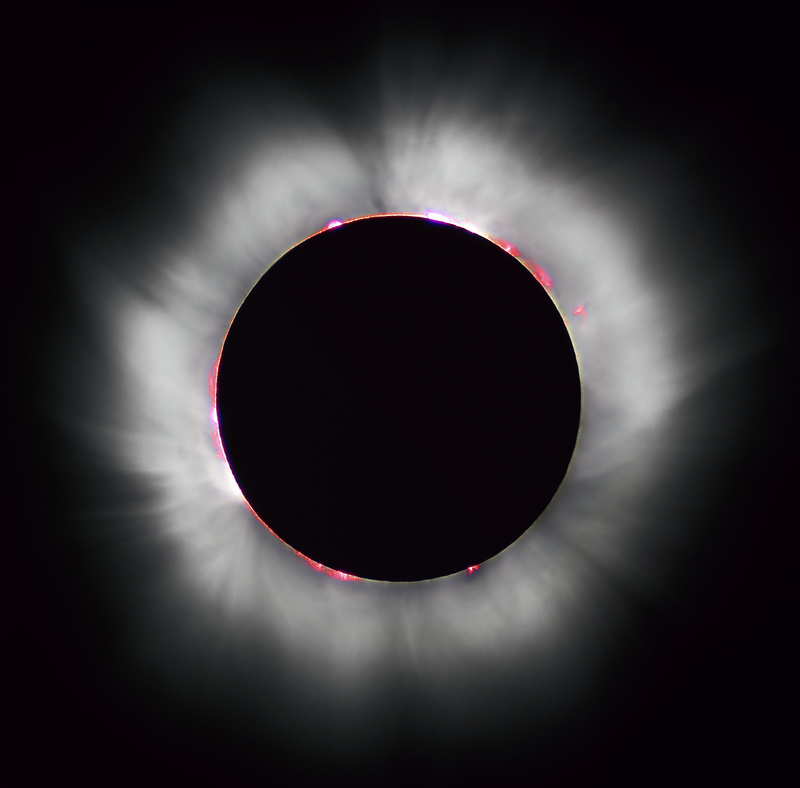 He and others are investigating whether the sudden absence of sunlight during the eclipse -- and especially of solar ultra-violet and x-rays -- would briefly change the properties of the upper atmosphere. 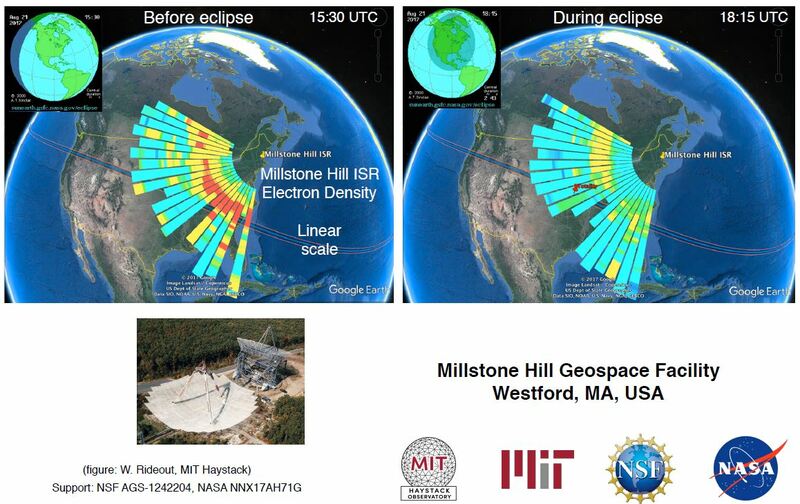 Professional ionospheric researcher Dr. Phil Erickson, W1PJE, head of the Atmospheric Sciences Group at MIT's Haystack Observatory, said he can say categorically that there was a definite, large, and measurable effect in the ionosphere from the eclipse. "We saw a 2X reduction in electron density during the eclipse for at least 45 minutes to 1 hour," Erickson told ARRL. "This reduction had direct impacts on HF propagation along the bottom side." Erickson said many models and observations exist from previous eclipses that demonstrate these effects. Erickson said MIT researchers used a "megawatt-class Thomson scatter radar," which can directly measure the plasma state of the ionosphere, including electron density, across a huge area in the eastern US. "Scientists in the worldwide space physics community will be using these and many other eclipse observations to learn more about our ionosphere, space weather, and its effects on navigation and communication signals including Amateur Radio," Erickson said. He has shared his data with the HamSCI team. Bob Reif, W1XP, was in southeastern North Carolina where the eclipse totality was about 97% with two radios running multiple bands of WSPR. "Lots of data to look at," he said, "but what jumped out was that at almost the exact time of maximum coverage of the sun at this location, 160 meters opened for about 30 minutes and then closed down again until the normal gray line. So, the D layer responded to the shadow of the Moon to some extent." Gene Greneker, K4MOG, in Georgia told ARRL that his own eclipse experiment "worked out rather well." He set up an RFSpace NetSDR receiver at his location, locked to a 10 MHz GPS standard and tuned to WWV on 15 MHz. "The NetSDR provides in-phase and quadrature components of the WWV signal, which allows relative signal phase to be reconstructed from recorded data," Greneker explained in a more-detailed account. "Signal phase-vector rotation change was chosen to indicate totality arrival, because phase is very sensitive to any change in propagation path length, possibly caused by ionospheric movement, up or down. Solar presence or absence can cause vertical ionospheric movement." Gene Greneker, K4MOG, said as the path of totality moved toward the southeast, solar radiation began to increase, and the path length decreased as the ionospheric reflecting point moved downward. Greneker recording the phase of the 15-MHz WWV signal from 1800 UTC until 1900 UTC on August 21. "Each time the path length changes by 1 wavelength, there is a 360° change in the phase of the signal," he said. Greneker offset the path of totality to the south, running parallel to the path between WWV in Fort Collins, Colorado, and his location in Atlanta. 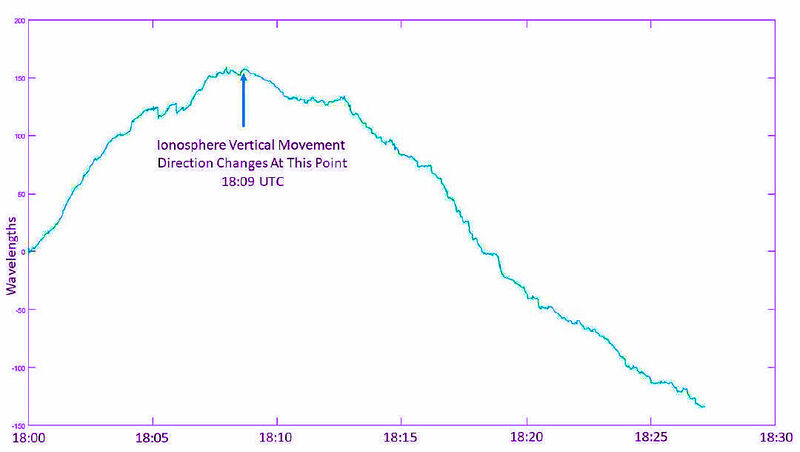 Greneker assumed that the reflection point off the ionosphere was south of Kansas City, and, he said, the minimum dip in the phase record occurred very close to totality at that location. "At 1809 hours UTC, when the totality point was parallel to the midpoint of the propagation path, the path length increased from zero wavelengths to 157 wavelengths, or 3,140 meters, during the intervening 9 minutes," he reported. As totality moved southeast, solar radiation began to increase and the path length decreases as the ionospheric reflecting point moves downward. Bob Skaggs, KB5RX, told ARRL he spent about 4 hours in the central part of Mission Valley, Montana, listening to conversations on various 20-meter frequencies with a low antenna. "At maximum of the eclipse, the propagation went almost to nothing for maybe about 15 or 20 minutes," he said. "As the eclipse receded, signals came back up." Skaggs tried 17 meters for 5 minutes at 1800 UTC and heard "no signals at all." He also said the local animal population responded to the eclipse as if evening were approaching. A new "pre-release" version of WSJT-X now is available. This is the Amateur Radio digital software suite developed by Joe Taylor, K1JT, that includes the increasingly popular FT8 mode. The September 2 release, WSJT-X version 1.8.0-rc2, fixes a number of issues, provides better performance, and offers some new features. "Implementation of FT8 and its auto-sequencing feature is now more capable and more polished," Taylor said in the release notes. "The decoder is faster and better. It now includes signal subtraction, multi-pass decoding, and the use of accumulated 'a priori' information as a QSO progresses. Sensitivity extends downward as far as -24 dB in some circumstances." Taylor said that overlapping signals "two and three deep" are frequently decoded at essentially the same frequency, and on a crowded band "we sometimes see more than 30 decodes in a single 15-second interval over a 2 kHz window." In addition, the North American VHF Contesting Mode has been expanded to include both FT8 and MSK144 modes, and the WSJT-X User Guide has been extensively updated. "Depending on what code revision you upgrade from, it may be necessary to do a one-time reset of the default list of suggested operating frequencies," Taylor pointed out. Some new features have been discussed in the WSJT Meteor Scatter and Weak Signal Group. Digital modes such as JT65 and FT8 require that your computer's internal time clock be set precisely. If your computer's clock is off by more than 1 or 2 seconds, contacts may be difficult or impossible. Internet time synchronization may be sufficient. The WSJT-X documentation recommends using Meinberg NTP on Windows machines to synchronize with internet time servers. President Donald Trump welcomed NASA astronauts Peggy Whitson, ex-KC5ZTD, and Jack Fischer, K2FSH, as they returned to Houston on September 3 following 6-month stints on board the International Space Station (ISS). 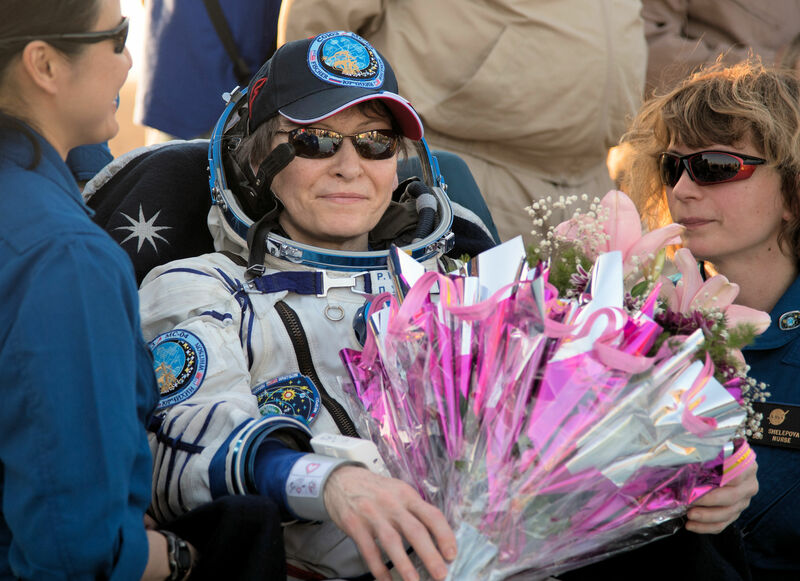 Whitson, a veteran space traveler, broke the record among US astronauts -- and women worldwide -- for the most cumulative time in space. Whitson, Fischer, and Russian cosmonaut Fyodor Yurchikhin, RN3FI, landed in Kazakhstan on Saturday after traveling from the ISS in a Russian Soyuz transporter. Trump spoke with Whitson and Fischer as they were en route by NASA plane to Johnson Space Center's Ellington Field. "I want to congratulate Peggy and Jack for their incredible accomplishments. They make us all very proud," Trump said. "Exploration has always been at the core of who we are as Americans, and their brave contributions to human spaceflight have continued that great tradition." Whitson, 55, now holds the record within the NASA corps of astronauts -- 665 days -- for most cumulative time in space, racked up during three long-duration missions. She is also the only female astronaut to command the ISS twice and was the first woman to do so. During her last mission, she was ISS commander from April 9 through June 1. Whitson also holds multiple spacewalking records. She was part of the ISS Expedition 5 crew in 2002, which was her first time in space. "Peggy is an inspiration to us all," the president said, "especially to young women interested in or currently pursuing careers in science, technology, engineering and math." This was the president's second telephone conversation with the two astronauts. 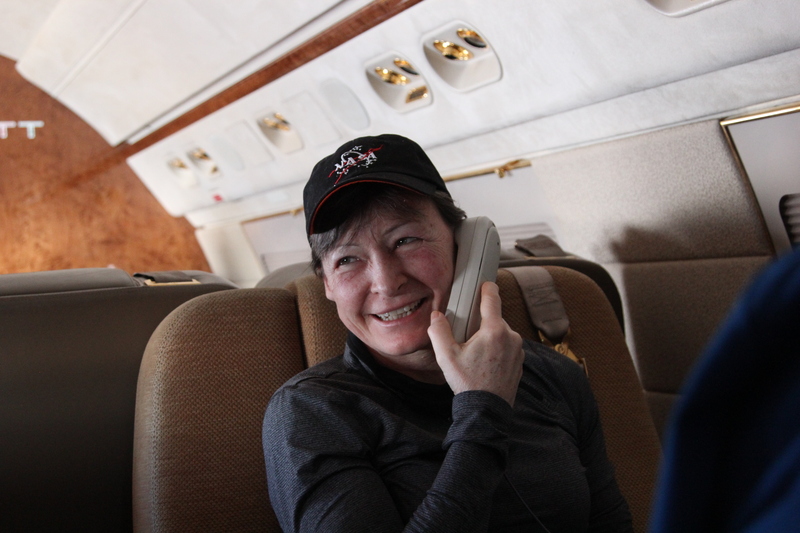 On April 24, when Whitson officially set the US record for most cumulative days in space, Whitson and Fischer received a celebratory phone call from Trump, his daughter Ivanka, and fellow astronaut Kate Rubins, KG5FYJ. Acting NASA Administrator Robert Lightfoot thanked the president for reaching out to Whitson and Fischer. "I want to add my thanks to the teams on the ground across the globe, especially in Houston, who are dealing with the aftermath of Hurricane Harvey, yet still maintained the focus to get Peggy and Jack home safely. It is an amazing team," Lightfoot added. NASA astronauts Joe Acaba, KE5DAR, and Mark Vande Hei, KG5GNP, and cosmonaut Alexander Misurkin will launch to the ISS aboard the Soyuz MS-06 spacecraft from Kazakhstan on September 12. NASA has invited accredited education institutions, nonprofit organizations, and NASA centers to submit applications for the agency's CubeSat Launch Initiative (CSLI). Applicants must submit proposals by November 21. Educational CubeSats often carry Amateur Radio payloads. "The CSLI provides CubeSat developers with a low-cost pathway to conduct research in space that advances NASA's strategic goals in the areas of science, exploration, technology development, education and operations," the announcement said. "The initiative allows students, teachers, and faculty to gain hands-on experience designing, building, and operating these small research satellites." To date, NASA has selected 151 CubeSat missions for its CSLI program, and 49 of these have been launched into space. NASA has offered a launch opportunities to 95% of those selected, with 44 scheduled for launch within the next 12 months. The selected CubeSats represent participants from 38 states and 85 unique organizations across the country. NASA will announce its selections by February 16, 2018, and selection does not guarantee a launch opportunity. Selected experiments will be considered as auxiliary payloads on NASA launches or for deployment from the International Space Station (ISS) starting in 2018 and continuing through 2021. US nonprofit and accredited educational organizations are responsible for funding the development of the small satellites. For this round of the initiative, NASA is particularly interested in participation from organizations in the District of Columbia, Puerto Rico, and 12 states not previously selected. These states are Delaware, Kansas, Maine, Mississippi, Nebraska, Nevada, New Hampshire, North Carolina, Oklahoma, South Carolina, South Dakota, and Wyoming. NASA said small satellites like CubeSats play a valuable role in its exploration, technology, educational, and science investigations, including planetary exploration, Earth observation, and fundamental Earth and space science. "They are a cornerstone in the development of cutting-edge NASA technologies like laser communications, satellite-to-satellite communications, and autonomous movement," the agency said. Visit the NASA CSLI web page for additional information. The Citrus Belt Amateur Radio Club of San Bernardino, California will host the 18th annual Route 66 On The Air special event, September 9-17. The event offers radio amateurs a chance to perhaps relive their own Route 66 memories and to celebrate the famed highway's 91st anniversary. Opened in 1926, US Route 66 was the first major improved highway to link the west coast with the nation's heartland; it once served as the backdrop for a popular TV show and has been the subject of songs and stories. There will be 21 stations -- two of them "rovers" -- operating in or around the major cities along Route 66 from Santa Monica, California, to Chicago, Illinois. They will use 1 × 1 W6-prefix special event call signs. The Route 66 special event stations will concentrate activity on these frequencies: CW -- 3.533, 7.033, 10.110, 14.033, 18.080, 21.033, 24.900, 28.033, and 50.033 MHz; SSB -- 3.866, 7.266, 14.266, 18.164, 21.366, 24.966, 28.466, and 50.166 MHz; Digital -- 3.580, 7.070, 10.140, 14.070, 18.100, 21.070, 24.920, and 28.120 MHz. Some participating clubs will also use VHF and UHF repeaters. Radio amateurs who operate while driving on Route 66 may take part in the event by using the designations "mobile 66" or "/66" after their call signs. Each participating club will issue its own commemorative QSL card to celebrate this event. Certificates are available. 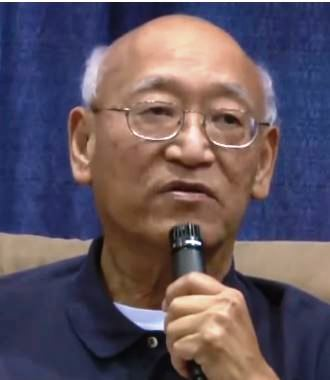 MFJ's Martin Jue, K5FLU, to Keynote W4DXCC DX and Contest Convention: MFJ founder Martin Jue, K5FLU, will be the special guest speaker at the W4DXCC DX and Contest Convention, September 22-23, in Pigeon Forge, Tennessee. Among presentations on DX and contesting topics, the convention will offer two forums on operating digital modes such as JT65 and the new FT8. Hal Kennedy, N4GG, will demonstrate "Blue Lighting," his 500 W spark transmitter. CWops will sponsor a Morse code copying contest. Register online. For more information, contact Dave Anderson, K4SV. Tad Cook, K7RA, Seattle, reports: Wow! What a week for solar activity. Although the solar cycle is trending toward a solar minimum in around 2020, we will still see notable upticks in activity, such as this week's surprises. On August 31, Spaceweather.com reported a G1 (minor) geomagnetic storm. The planetary A index was 59. The following day Spaceweather.com reported geomagnetic unrest with a planetary A index of 19. This index rose to 26 on September 2, when Spaceweather.com reported sunspot group AR2674 "rapidly growing, increasing in both area and sunspot count." Spaceweather.com said that as the sunspot grows, its magnetic field is becoming unstable, posing a threat for M-class solar flares. 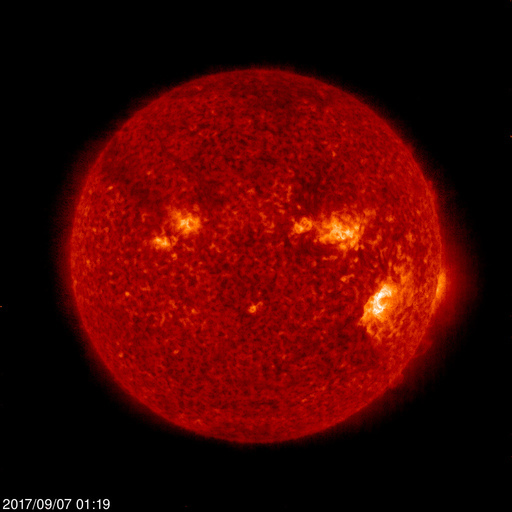 The planetary A index was 9 on September 3, when Spaceweather.com reported two huge sunspot groups facing Earth -- AR2674 and AR2673, the latter quadrupling in size with multiple dark cores breaching the Sun's surface in the past 24 hours. On September 4, the planetary A index was 18, and Spaceweather.com said AR2673 was "seething with activity." NOAA's Space Weather Prediction Center said a moderate (R2) radio blackout was observed on September 4 and a strong (R3) radio blackout occurred on September 6 in the wake of a strong X9.3-class solar flare. The September 6 flare followed an X2.2 flare, also R3. Predicted solar flux is 135 on September 7-9; 130, 120, 110, and 100 on September 10-13; 85 on September 14-17; 88 on September 18; 92 on September 19-21; then 95, 98, 100, and 105 on September 22-25; 110 on September 26-October 2; 105 on October 3-5; 100, 95, 90, 85, and 80 on October 6-10; 85 on October 11-14; 88 on October 15; 92 on October 16-18, and 95, 98, and 100 on October 19-21. Predicted planetary A index is 45, 65, 50, 30, 15, 8 and 28 on September 7-13; 30 on October 14-15; 25 and 12 on October 16-17; 5 on October 18-19;, 8 on October 20, and 5 on October 21. Sunspot numbers for August 31-September 6 were 59, 62, 71, 96, 122, 122, and 79, with a mean of 87.3. The 10.7-centimeter flux was 91.9, 93.4, 100, 120.2, 140, 120.5, and 132.9, with a mean of 114.1. Estimated planetary A indices were 31, 19, 26, 9, 18, 12, and 11, with a mean of 18. Estimated mid-latitude A indices were 20, 17, 25, 10, 16, 11, and 18, with a mean of 16.7. Copyright © 2017 American Radio Relay League, Incorporated. Use and distribution of this publication, or any portion thereof, is permitted for non-commercial or educational purposes, with attribution. All other purposes require written permission.